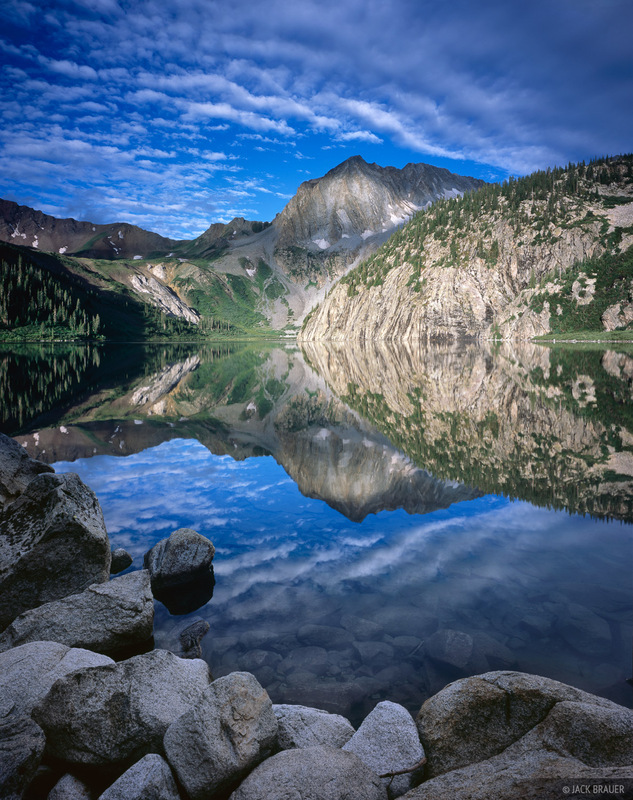 This popular hike in the Elk Mountains near Aspen is referred to as the Four Pass Loop. 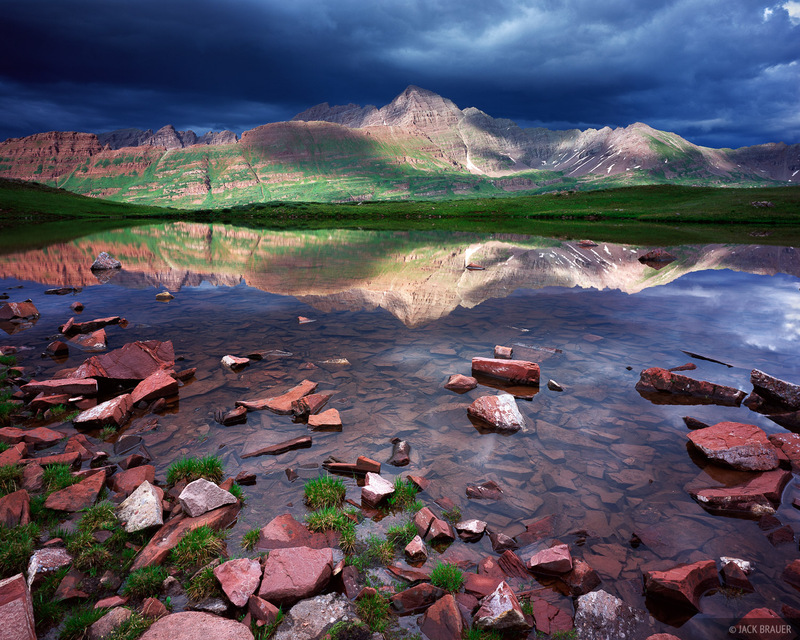 It is about 25 miles long, and passes over four high mountain passes, circumnavigating the famous Maroon Bells fourteeners. While some superhumans can run this entire route in one day, I took my time - spending five days and four nights backpacking along the way. The scenery is absolutely stunning the entire way, making this one of the premiere treks in all of Colorado, if not North America. 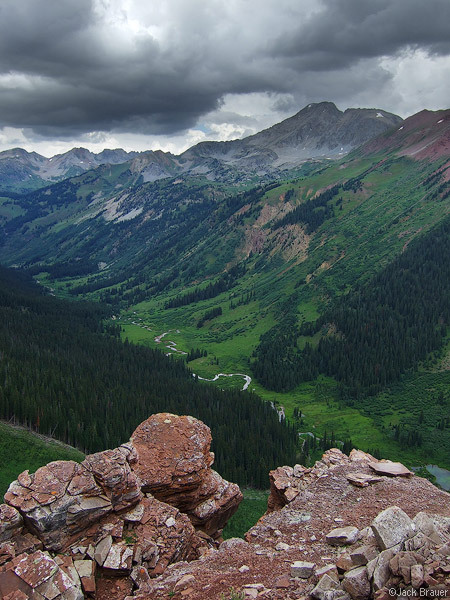 Colorado's summer monsoons were in full effect during my hike; every afternoon enormous dark clouds would roll through, pounding the mountains with lightning, thunder, rain, and hail. It was critical to start hiking early in the morning each day in order to make it over the high exposed passes before the rumbling began. Much of the afternoons and evenings were spent hunkered down in my tent protected in the trees, watching the flashing of nearby lightning and bone-rattling cracking of thunder all around. I did manage to get out to take some photos in the breaks between the storms, but almost every time I ended up having to pack up my gear in haste and run back to the safety of the trees as the storms returned. Here are a few of my favorite shots from the trip, from both the 4x5 camera and the little digi. 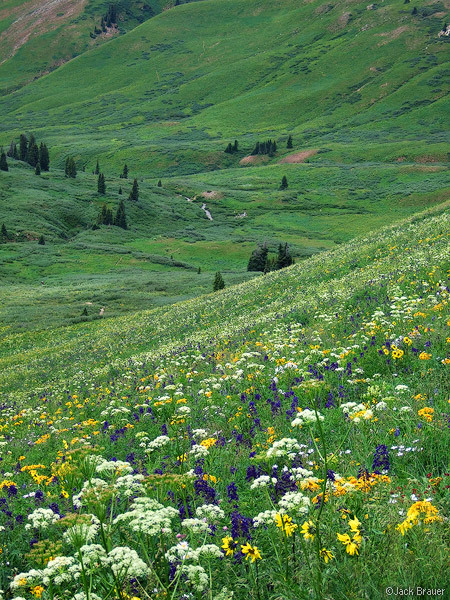 Wildflowers in a lush green high alpine basin in the Elk Mountains. The dark storm clouds were starting to rumble, so immediately after taking this picture, I packed up my gear as quickly as possible and ran a half mile to the shelter of the nearest trees. The next three or four hours were spent inside the tent listening (and feeling) the cracking booms of lightning and thunder. 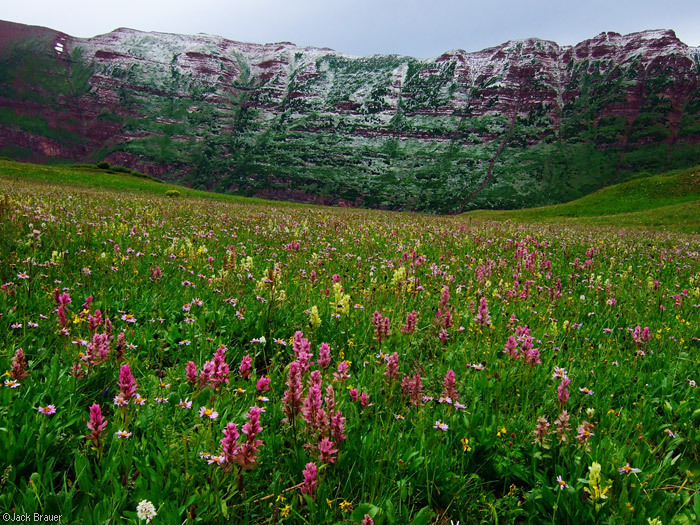 Piles of hail cover a lush green mountainside in the Elk Mountains after a summer thunderstorm. An incredible view from my high perch at an off-trail campspot high above the lower Fravert Basin valley. Hagermann Peak in the background. 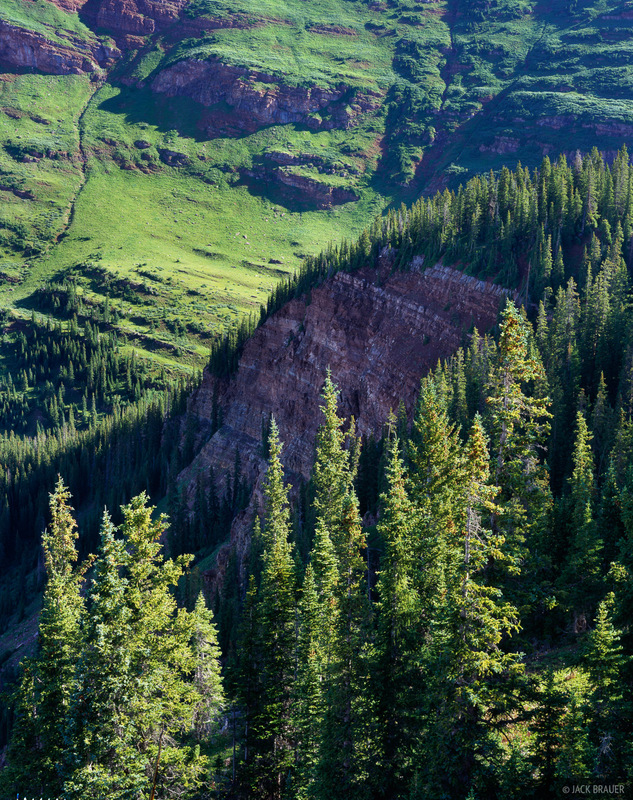 Morning light shines on luscious green pine forest in Fravert Basin. 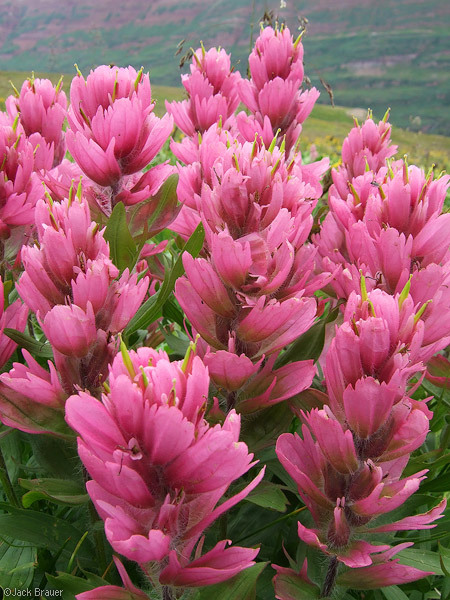 Posted in Backpacking & Trekking, Colorado and tagged Colorado, Elk Mountains.